First update in 2018. That one focuses on graphical improvements. 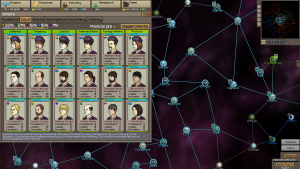 Courtiers, departments and events graphics improved. Also, statistics of governors (on Empire/Summary tab) which should give you a clear picture how many governors of what competence you have. 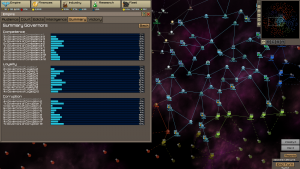 – [interface] Departments are color coded now. All courtiers portraits got collars colored by department they are assigned, department stats have bars to indicate the department and departments names on the court screen are color coded well. Overall, it’s much easier now to spot who belongs to what department. – [interface] Moved rebels to a separate sub summary to avoid clutter on the summary screen (especially since most of the info about rebels is on the top menu tooltip anyway). – [interface] Added image for admiral report. 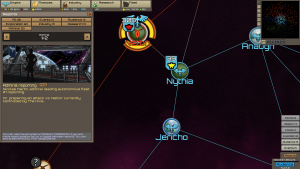 Also admiral reports now have a Find button to track the target planet. – [interface] Added image for industry (shipyard production) report. – [fix] Admiral reporting “in warp” and “admiral orders reconquest of lost planet” bug. This entry was posted in New Version, Stellar Monarch on January 15, 2018 by Chris. I was thinking about the promised expansion pack for Stellar Monarch and decided to write first my views on expansion packs/DLCs in general. It is intended for Stellar Monarch’s expansion but it should apply to all my games I suppose, maybe with some exceptions/differences. So here it is, my policy on expansion packs. The premise of an expansion pack is to extend the base game, not to fix it or make it playable. The base game comes first, it must stand on its own and be complete. Once that’s achieved an expansion can be introduced. This entry was posted in Blog on December 21, 2017 by Chris. The last version this year. First of all, change language was moved from experimental to regular options (can be accessed from quick menu). At the moment we have PL and RU translation ready, FR will be in the next version, DE probably within 2 months. In addition I have rebalanced some stuff (speed and acceleration) and cars base specs were adjusted depending on car type (for example sports cars are generally faster than pickups even in case of the same weight to power ratio since those are built for speed, limousines cars have heavy bodies and so on). And traditional interface improvements aimed to make more intuitive. – [feature] Translation moved to regular options (also improved translation code, made the selection saveable, etc). – [feature] Body weight, top speed and acceleration affected by car type. – [translation] PL translation done (note that translation might be not fully complete, especially when a new version is introduced there might be a few texts missing. Manual not translated yet). – [translation] RU translation done (note that translation might be not fully complete, especially when a new version is introduced there might be a few texts missing. Manual not translated yet). – [balance] Easier to increase top speed for low speeds and harder for high speeds. – [balance] Acceleration much harder to increase. – [interface] Improved and fixed some tooltips. – [interface] World screen show number of “virtual” sales offices due to strategy. – [interface] World screen shows number of our cars sold in this region with a tooltip explaining how to enable distribution in this region. Also, I would like to send my Christmas wishes to all players, youtubers, press and fellow developers. May our Lord’s blessing be with you and your family this year, next year and always. Happy Christmas! This entry was posted in Automobile Tycoon, New Version on December 21, 2017 by Chris. A small update containing interface improvements and some low priority fixes. – [interface] Planet list button selection persistent and greyed out if not selected. 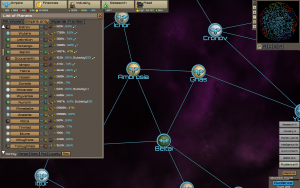 – [interface] Added subsidies that are in effect to the List of Planets. – [interface] Beautified menu audio options. – [interface] Buttons color changed from yellowish to gold. – [fix] Incorrect Admiral summon tooltip (also made the tooltip more descriptive). – [fix] Audio rare crash fix (crash if no headphones plugged in/turned on if headphones are the only audio device, also added a warning if no device plugged in). This entry was posted in New Version, Stellar Monarch on November 20, 2017 by Chris. Finally, newspaper is here! It popups each time there is a big world event (wars, economic crises, etc). Added bankruptcy mechanic (which can be disable via advanced options upon game start), option to retire, secretary and many smaller improvements. – [feature] Bankruptcy (negative money) will cause a game over if not dealt with within 8 turns (can be disable via advanced options upon game start, existing saves before v0.15 have it disabled). 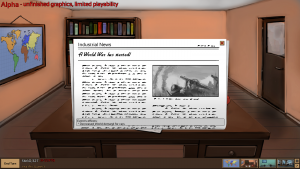 – [feature] Newspaper (with big events like wars, economic crises, law changes, etc). – [feature] Added “Call your secretary” phone option (option to disable Quarterly report, etc). – [feature] Added “Call your uncle” phone option useful when you have trouble with money, using this option reduces the final score (score is not implemented yet). – [feature] Option to retire (phone/secretary). – [misc] Adjusted historical events dates (takes into account quarters, not just years). – [interface] Improved quarterly report. – [interface] Added global economy meter to quarterly report, so it’s easier to grasp how events affect demand for cars. – [interface] Bankruptcy warning popup. – [interface] Beautified menu options (Gameplay, Video, Audio). This entry was posted in Automobile Tycoon, New Version on November 13, 2017 by Chris. 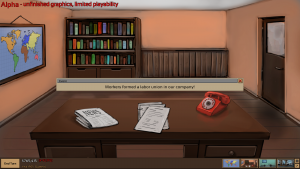 This version introduces workers, labor unions and strikes. Now you need to hire/fire workers, set their wages and possibly deal with labor unions and strikes if the workers are too unhappy. There was also balancing done in this version, research is faster now and banks easier to deal with (depending on difficulty). The promised newspaper feature is not here yet because I’m still waiting for the artist’s assets, it will be in the next version. 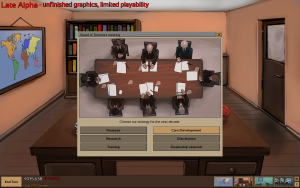 – [feature] Hiring and firing workers. – [feature] Labor unions and strikes (can be disabled in advanced options upon game start). – [feature] Added skill of workers which grants production output bonus (newly hired workers start with a very low skill). – [feature] Added reporting of finished cars/components development. – [balance] Adjusted research budget levels effect and cost of research budget levels. – [balance] Higher bank loan limit, lower bank interest rate. 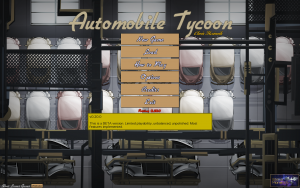 This entry was posted in Automobile Tycoon, New Version on November 2, 2017 by Chris.